• Doesn't heat up fuel like larger inline or intank pumps. • No octane loss (gas will begin to boil at 95 degrees). 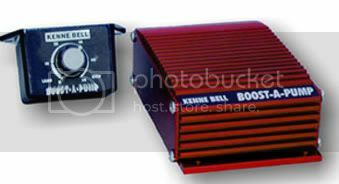 • Used with all Kenne Bell Supercharger Kits. • Increases existing fuel pump capacity up to 50%. • Easily installed. Uses stock wiring. No fuel line modifications. • Adjustable from 1% to 50% - ON DEMAND from driver's seat. • Variable Output Cockpit Controller mounts under dash. • No batteries to run down, replace or let you down. • Eliminates expensive and time consuming fuel tank removal. • Works with any pump full or part-time. • Activation vacuum or pressure switch included in kit. • Compensates for reduced voltage (lower pump output) when lights or other accessories are on. voltage (down to 10 volts). • Quiet operation. Not NOISY like in line pumps. • Maintains stock fuel pressure at idle and part throttle. 10 to 12.5 battery voltage. • Doesn't affect pump life. • Ideal for any Nitrous System. • Works on any car, truck, or boat with 12V electric fuel pump. • Compact size, lightweight (less than 2 lbs. ).